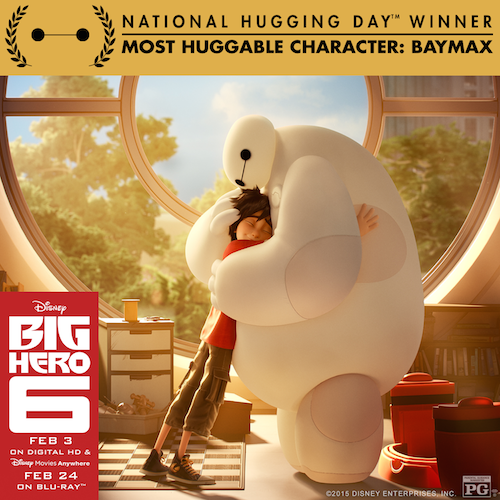 After much deliberation and even more hugging, Baymax, the lovable personal companion robot and star of Walt Disney Animation Studio’s action-packed comedy adventure and Academy Award® Nominated film “Big Hero 6,” was today named Most Huggable Character of 2015 on National Hugging Day™! The coveted award was presented by the Ambassador of Hugs (HA! ), Kevin Zaborney, founder and creator of National Hugging Day.™ Baymax humbly accepted the award from his residence in San Fransokyo where he attributed the honor to his “non-threatening, huggable design” and said he looks forward to spending the upcoming year giving and receiving hugs from all. The Most Huggable Character Award coincides with this month’s National Hugging Day™ held annually on January 21. National Hugging Day™ was created to encourage people around the world show more affection in public. There is only one way you are supposed to celebrate the holiday: offer a hug to anyone and everyone you want. If you plan on hugging Baymax, however, please be sure to empty your pockets of any and all sharp objects first. Pre-order Big Hero 6 today for 50% off! Past winners of the Most Huggable Awards have included Joan Rivers who wrote after receiving her award, "I'm tempted to start saying 'Can we hug?' 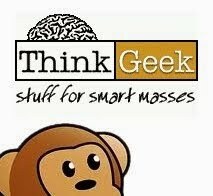 instead of 'Can we talk'" alluding to her participating in a telephone company ad; Jeff Ondash (aka Teddy McHuggins); Tessla Queen (bingtopia.com); and Mata Amritanandamayi (Kerela, India known as the "Hugging Saint"). Disney’s “Big Hero 6” will be available nationwide on Digital HD and Disney Movies Anywhere February 3 and on Blu-ray™ Combo Pack February 24. Funko Looking for Big Trouble...In Little China! A New Avengers: Age of Ultron Trailer! Let's Rip Apart the Ant-Man Trailer! Marvel's Agent Carter Premieres Tonight!